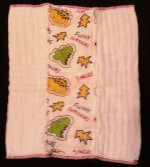 Prefold diapers or "prefolds" are your basic cloth diaper. They consist of consist of several layers of an absorbent material, usually cotton, sewn together. A prefold has three sections, with the middle being the thickest and most absorbent. When you see a prefold described as “4x8x4” this means that it has two outer sections of 4 layers of material and one middle section with 8 layers. Some diapers only have 4 absorbent layers in the middle, so they would be 4x6x4. These diapers are usually a rectangular shape and vary in length and width. You can find them as small as 9.5 x 13 inches for preemies or as big as 15.25 x 20.5 inches for a toddler. Most babies will only need two or three sizes to last through their diapering years. Prefolds are not water proof and do require a cover. The most common question about prefold diapers is what size to get. Sizing can be quite confusing when you see 14x16.5 and you don't really know what that means. When reading the size of a prefold, make sure that the measurements you see or washed or unwashed. If they are unwashed measurements your prefolds will shrink 5-10%. Let's take the size 14x16.5 and use it as an example. The 14 is the width of the diaper. This is the part that will wrap around your babies waist and get fastened. The width does not have to be as wide as your babies waist, because when you fasten them with a Snappi or pins, you can get a more custom fit. You can fasten the diaper anywhere from the sides of your baby's waist to the middle. So you really only need the width to be a little over half the size of your babies waist. The 16.5 is the length. This is how long the rise of the diaper will be. Often times you will find that the length of a prefold is much longer than the rise of your baby. This means your baby can grow and still fit into the prefold for awhile. To get a good fit just fold down the extra length of the diaper for a custom fit. Most stores that carry prefolds will have the standard sizes - Infant and Premium. There are some other stores such as Diaper Junction. and Green Mountain Diapers that have small, medium, and large sizes. These prefolds are wider and shorter and in my opinion are a much better fit on a baby. The standard Premium size is 12x18, which means your baby will outgrow the width but still have tons of room in the rise. I never have understood the sizing of that. I highly recommend the Diaper Rite prefolds at Diaper Junction. They are very soft and they have excellent prefold packages that include covers. How Do You Use A Prefold? Prefold diapers are very easy to use once you learn how. There are many different folds you can use to get a great fit on your baby. You can also trifold a prefold, or fold the two outer panels over the middle panel, and then lay it into a cover. I have made an extensive picture tutorial for How To Fold A Prefold. Prefolds are a great diaper for around the house. They aren't as absorbent as some of the nicer fitteds or pocket diapers, but you can make a prefold more absorbent by adding a doubler. If you have a light to moderate wetting baby, a prefold will last for about two hours without a doubler. If you have a heavier wetting baby, you will need to add a doubler or change every hour. If you get a really good doubler, you can use a prefold over night! Prefold diapers are made with cotton, but you can also find prefolds made with either bamboo or hemp. Bamboo prefolds have become very popular because they are more absorbent and very stretchy. Of course bamboo and hemp are a more expensive material, so you will pay $5 and up for a prefold made with these. Generally I see bamboo prefolds for $10 or more. You can also liven up your basic cotton prefolds with colorful dye or embellishments. Embellishing means when you take a printed fabric, usually a cotton knit or flannel, and sew it onto the decorate the center panel of your prefold. You can do this yourself or buy them already done. I have some that are wahm made and I love them. Prefold diapers really are great economical diapers! You can build a stash of prefolds and covers to last 2-3 days for under $100. 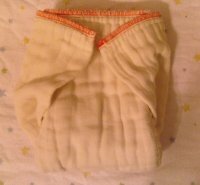 If you are looking to save money by using cloth diapers, these are the way to go! You really can't beat the price. And prefolds also make great doublers, inserts for your pocket diapers, or burp rags. And when your done with them, you can use them for cleaning. I have some prefold diapers that I love to use for cleaning around the house - that is once I was done using them for burp rags. I think every stash should have at least a few prefolds in it.